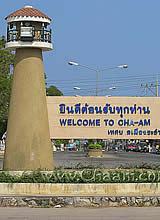 Cha-Am is located directly at the Gulf of Thailand, so the climate is relatively mild and stable. The average annual temperature is about 28 Degrees Centigrades. In Cha-Am and in many parts of Thailand are three seasons: The cool season from about October to March, the hot season from March to May and the rain season, from May to October. It is amazing that in Cha-Am is in rain season only very little rain, while in the same time in the 30 km neighboring city Hua-Hin are storms and heavy rain. if it rains, it is mostly only for one or two hours and then the sky clears up again. So also during the rainy season, where everything is much cheaper, Hotels, rented houses and rented cars or motorbikes, we can also recommended, making holidays in Cha-Am! The most tourists and Thailand travelers are coming in the cool season, the high season. Many hotels and museums are in that time hopelessly overcrowded and in some cases, the prices doubled in the high season. The temperatures at night sometimes down to below 20 degrees during the day are between 25 to almost 30 degrees. The hot season is in some years really hot! In April 2010, we measured 46 degrees in the shade. But that was really a hot record! Normally the daily average temperature is about 36 degrees in that season. At night it "cools down", to about 28 - 30 degrees. The climate in the beach resort Cha-Am is for the body a very healthy and pleasant climate. The always fresh sea air is good for the lungs and bronchi.